The Adventures of Etienne Gerard: VII. 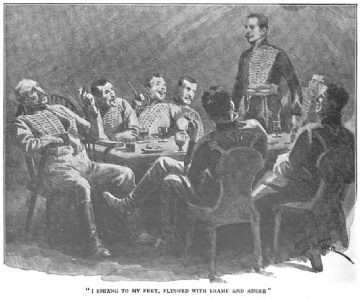 - How the Brigadier Joined the Hussars of Conflans is a short story written by Arthur Conan Doyle first published in The Strand Magazine in april 1903. 16th story of the Gerard saga. 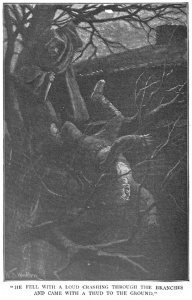 "He fell with a loud crashing through the branches and came with a thud to the ground." "I sprang to my feet, flushed with shame and anger." "A cold chill passed up my back and my hair rose." 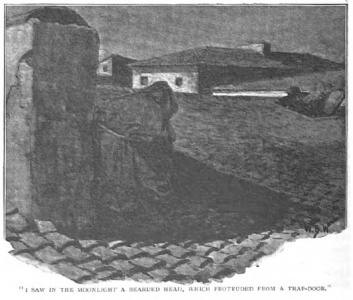 "I saw in the moonlight a bearded head, which protruded from a trap-door." "The man was indeed in a hopeless flight." "I saw that her piercing dark eyes were fixed upon my right hand." "With one impulse the twelve swords flew from their scabbards and were raised in salute." I held it up, and if my amazement was lessened my horror was increased by that which it revealed. "I have one favour to ask you, gentlemen," said I. "Marshal Lannes has invited me to breakfast and I cannot keep him waiting." 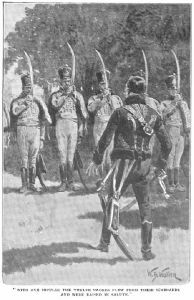 You must know, then, that it was in the Second Hussars — called the Hussars of Chamberan — that I had served as a lieutenant and as a junior captain. At the time I speak of I was only twenty-five years of age, as reckless and desperate a man as any in that great army. 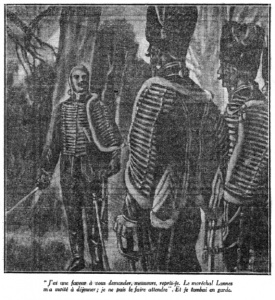 You have read, no doubt, of this famous siege of Saragossa, and I will only say that no general could have had a harder task than that with which Marshal Lannes was confronted. The immense city was crowded with a horde of Spaniards — soldiers, peasants, priests — all filled with the most furious hatred of the French, and the most savage determination to perish before they would surrender. There were eighty thousand men in the town and only thirty thousand to besiege them. Yet we had a powerful artillery, and our engineers were of the best. There was never such a siege, for it is usual that when the fortifications are taken the city falls, but here it was not until the fortifications were taken that the real fighting began. Every house was a fort and every street a battle-field, so that slowly, day by day, we had to work our way inwards, blowing up the houses with their garrisons until more than half the city had disappeared. Yet the other half was as determined as ever and in a better position for defence, since it consisted of enormous convents and monasteries with walls like the Bastille, which could not be so easily brushed out of our way. This was the state of things at the time that I joined the army. Again there was a roar of laughter. 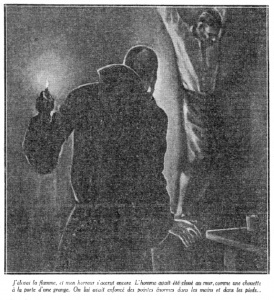 I can see the ring of faces, the mocking eyes, the open mouths — Olivier with his great black bristles, Pelletan thin and sneering, even the young sub-lieutenants convulsed with merriment. Heavens, the indignity of it! But my rage had dried my tears. I was myself again, cold, quiet, self-contained, ice without and fire within. "I will explain. We have a French agent within the town named Hubert. This brave man has been in constant communication with us, and he had promised to explode the magazine. It was to be done in the early morning, and for two days running we have had a storming party of a thousand Grenadiers waiting for the breach to be formed. But there has been no explosion, and for these two days we have had no communication from Hubert. The question is, what has become of him?" "Precisely. Is he ill, or wounded, or dead? Shall we still wait for him, or shall we attempt the attack elsewhere? We cannot determine this until we have heard from him. This is a map of the town, Captain Gerard. You perceive that within this ring of convents and monasteries are a number of streets which branch off from a central square. If you come so far as this square you will find the cathedral at one corner. In that corner is the street of Toledo. Hubert lives in a small house between a cobbler's and a wine-shop, on the right-hand side as you go from the cathedral. Do you follow me?" However, all was silent save for the chimes striking midnight in the city. I crept along the branch and lifted myself on to the roof. The Spaniard's gun was lying there, but it was of no service to me, since he had the powder- horn at his belt. At the same time, if it were found, it would warn the enemy that something had happened, so I thought it best to drop it over the wall. Then I looked round for the means of getting of the roof and down into the city. It was pitch-dark within — the more so as I had closed the door behind me. I felt round and came upon the edge of a table. Then I stood still and wondered what I should do next, and how I could gain some news of this Hubert, in whose house I found myself. Any mistake would cost me not only my life but the failure of my mission. Perhaps he did not live alone. Perhaps he was only a lodger in a Spanish family, and my visit might bring ruin to him as well as to myself. Seldom in my life have I been more perplexed. And then, suddenly, something turned my blood cold in my veins. It was a voice, a whispering voice, in my very ear. "Mon Dieu!" cried the voice, in a tone of agony. "Oh, mon Dieu! mon Dieu!" Then there was a dry sob in the darkness, and all was still once more. "They discovered me. They have killed me for it. But before I die let me tell you what I know. A little more of that wine, please! Quick! Quick! I am very near the end. My strength is going. Listen to me! The powder is stored in the Mother Superior's room. The wall is pierced, and the end of the train is in Sister Angela's cell, next the chapel. All was ready two days ago. But they discovered a letter and they tortured me." "It seems like two years. Comrade, I have served France, have I not? Then do one little service for me. Stab me to the heart, dear friend! 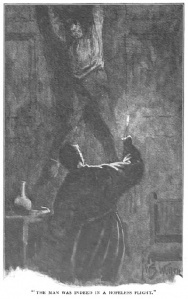 I implore you, I entreat you, to put an end to my sufferings." But on my forefinger I wore a heavy gold ring — the gift of a certain German baroness whose name I may not mention. It shone brightly in the light of the altar lamp. 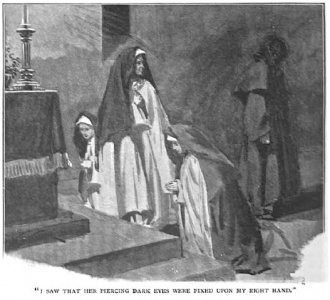 Now, a ring upon a friar's hand is an impossibility, since they are vowed to absolute poverty. Even now if they had had the wit to put a barrel of powder against the door I should have been ruined. It was their only chance, for I had come to the final stage of my adventure. 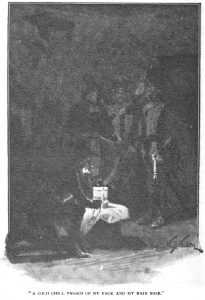 Here at last, after such a string of dangers as few men have ever lived to talk of, I was at one end of the powder train, with the Saragossa magazine at the other. They were howling like wolves out in the passage, and muskets were crashing against the door. I paid no heed to their clamour, but I looked eagerly around for that train of which Hubert had spoken. Of course, it must be at the side of the room next to the magazine. I crawled along it on my hands and knees, looking into every crevice, but no sign could I see. Two bullets flew through the door and flattened themselves against the wall. The thudding and smashing grew ever louder. I saw a grey pile in a corner, flew to it with a cry of joy, and found that it was only dust. Then I got back to the side of the door where no bullets could ever reach me — they were streaming freely into the room — and I tried to forget this fiendish howling in my ear and to think out where this train could be. It must have been carefully laid by Hubert lest these nuns should see it. I tried to imagine how I should myself have arranged it had I been in his place. Yes, yes, there was a thin black line, which disappeared through a small hole in the wall. I tilted over the lamp and threw myself on the ground. Next instant came a roar like thunder, the walls wavered and tottered around me, the ceiling clattered down from above, and over the yell of the terrified Spaniards was heard the terrific shout of the storming column of Grenadiers. As in a dream — a happy dream — I heard it, and then I heard no more. "Meanwhile, Captain Gerard, it is half-past four, and you must be starving after such a night of exertion. My staff and I will breakfast inside the city. I assure you that you will be an honoured guest." When I reached the roofless house in which we had held the consultation the night before, I threw of my gown and I put on the busby and sabre which I had left there. This page was last edited on 6 January 2019, at 00:01.